Office and Meeting Room Passes. Different sizes. Per days or hours. 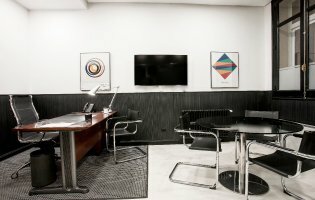 Offices and Meeting Rooms. The more you use them, the less they cost. Ongoing assistance from our Executive Secretaries during your meeting. We guarantee the best image for your meetings from 9:00 a.m. to 8:00 p.m. Passes for 10/20 hours, can be used at both Business Centers. >> Decorated and personalized emblematic executive offices. Round table for meetings. >> Executive Secretary: Administrative-Telephone Reception Service in Spanish and English to assist you with all of your business procedures, formalities and visitors, from 9:00 a.m. to 8:00 p.m.
>> Registered address, tax domicile or business address for your company. Start working immediately with the most emblematic image and a Specialized Administrative Staff.